How to construct the altitudes of acute, obtuse and right triangles? 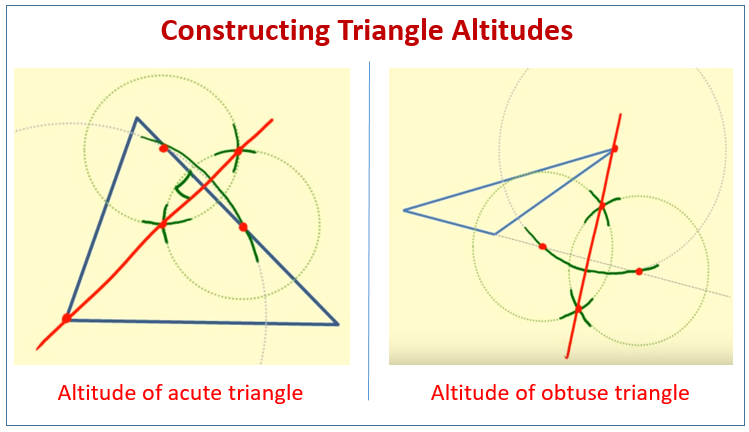 The following diagrams shows how to construct altitudes for an acute triangle and an obtuse triangle. Scroll down the page for more examples and solutions. Altitudes are defined as perpendicular line segments from the vertex to the line containing the opposite side. In each triangle, there are three triangle altitudes, one from each vertex. In an acute triangle, all altitudes lie within the triangle. In a right triangle, the altitude for two of the vertices are the sides of the triangle. In an obtuse triangle, the altitude from the largest angle is outside of the triangle.